Protein is an integral part of the daily diet, whether for strength training or for trying to preserve muscle mass throughout the aging process. A recently published review study in Nutrition and Metabolism1 suggests that the quality of protein consumed for muscle building is more important than previously perceived, with whey protein’s high leucine content providing clear muscle benefits. The study’s author, Dr. Stuart M. Phillips, Canada Research Chair in Skeletal Muscle Health and a professor at MacMaster University, examined the effects of the quality of supplemental protein with a number of measures, including muscle mass, strength and body composition in individuals who strength train. Dr. Phillips found that in combination with resistance exercise, whey protein will better lead to leaner body mass, improved body composition and preserved muscle mass due to the presence of leucine (an essential amino acid) and its fast digestibility rate. He suggests this is because protein sources providing leucine are best for muscle protein synthesis and muscle growth. Whey protein is a leucine-containing milk protein that is proven to be a high-quality protein supplement because of the inclusion of essential amino acids and its fast digestibility rate. This review study found that leucine is a trigger for working muscles to synthesize more protein, stating that it works by, “turning protein synthesis on like a light switch, so there can be greater gains, such as improved lean muscle mass and improved composition.” A new protein measurement method, the Digestible Indispensable Amino Acid Score (DIAAS), found that whey proteins have a higher rating than other protein sources such as soy, pea or rice. Dr. Phillips also notes that consuming leucine-rich whey protein is not just for strength trainers. 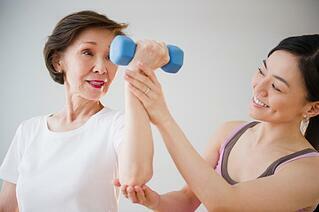 When combined with resistance exercise, protein can also help preserve muscle mass throughout the human lifespan. This is an important factor to consider as consumers age and their ability to maintain muscle mass declines, a result of the age-related loss of muscle and function known as sarcopenia. Consumers can maximize their gains and get the most out of their workouts by selecting sports nutrition products that have a favorable amino acid profile and digestibility rate. In this case, whey protein is the way to go. To learn more about the functional and nutritional benefits of whey protein, visit. ThinkUSAdairy.org. Note: This study was funded and supported by the Whey Protein Research Consortium, the Canada Institutes for Health Research, the National Science and Engineering Research Council of Canada, and the Canada Research Chairs program.